An interesting, but unsettling thing happens to many occupants of brand new houses, especially when the houses are built in the summer and occupied in late summer or fall. New houses are frequently infested with foreign grain beetles, a common and often abundant "fungus" beetle found throughout the world. In my opinion, this annoying little beetle should be renamed the "new house beetle" because I seldom receive samples or calls from people finding this insect in foreign grain. Calls and samples from new home owners, on the other hand, are quite common. The foreign grain beetle is abundant during late summer and fall. The reddish-brown beetles are small, only 3/32 inch long which is slightly more than half the length of the familiar red flour beetle. The shape is similar to that of the flour beetle, but the most noticeable difference, in addition to the smaller size, is the presence of tiny knobs or bumps on the front corners of the thorax. A good magnifier is necessary to see this distinguishing character. The beetles are strong fliers and they are attracted to lights. 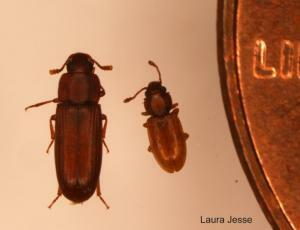 beetle (left) for a size comparison. Foreign grain beetle adults and larvae feed on molds and fungi, and not on grain as the name would imply. However, they often infest damp or spoiled grain and are common in grain storage facilities, giving rise to their name. Almost any mold or fungus growth may support foreign grain beetles. They are common "outdoor" insects and may enter homes in small numbers as "accidental invaders" through screens, cracks, and crevices, or around windows and doors. Normal exclusion techniques as for other accidental invaders can be used in this case. However, as indicated above, foreign grain beetles are most frequently discovered as an unwanted house-warming guest in newly-constructed homes. The beetles come from inside walls where molds are growing because of moisture that was sealed into the walls during construction. This moisture could come from wood left outdoors and exposed to rain before or during building, rain that blew into the house before it was "closed in," or moisture from drywall compound applied over sheetrock. Beetles emerge from the new house walls for a period of several weeks until the house completely dries out. Foreign grain beetles are a nuisance and annoyance but do not harm anything within the home. They cannot bite or sting and do not attack plants, furniture or the house structure. Further, they do not infest stored products and thus, are not "pantry pests." Problems with this pest are usually self-limiting as the seasons change and as moisture trapped in new houses dries out naturally. If known moisture problems exist in an infested house (e.g., leaky pipes within a wall), these should be corrected. If the beetles are known to be originating outdoors, there may be some benefit to exclusion techniques such as a use of tight-fitting screens and doors and sealing or caulking cracks and crevices around windows, doors and screens to reduce the amount of entry. Beetles already inside the home can be vacuumed or swept up and discarded.